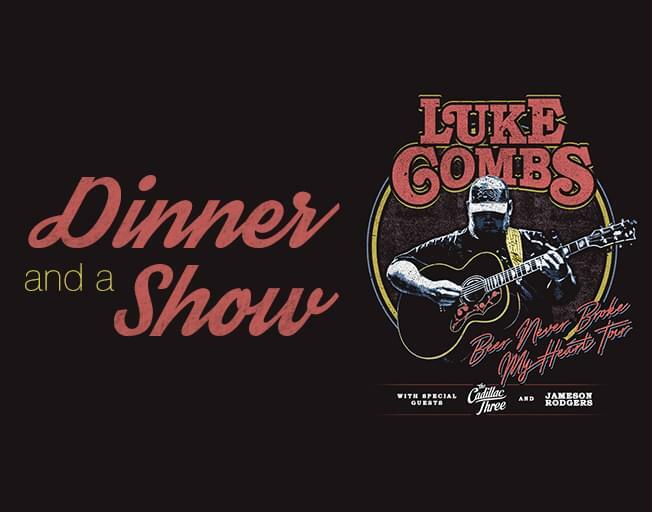 We are giving you the chance to win Dinner & a Show with SOLD-OUT Luke Combs tickets and a Tony Roma’s gift certificate! Luke Combs is bringing his “Beer Never Broke My Heart Tour” with special guests Cadillac Three and Jameson Rodgers to Grossinger Motors Arena Friday, September 27th. The concert is SOLD-OUT! B104 Insider Rewards members can win tickets to the SOLD-OUT show with a $50 Tony Roma’s gift certificate to make it Dinner and a Show! If you are not a member of the B104 Insiders yet you don’t have to miss out. Membership is completely FREE and it only takes a couple of minutes to register. Click Here to Sign-Up Now. New members can win Dinner & a Show with SOLD-OUT Luke Combs tickets if you were wondering. We will announce the winner Monday, April 15th (why not get to have some good news on tax day … LOL). You need to make sure to Enter to Win by 11:59 PM Sunday, April 14th. This is your chance to win Dinner & a Show with SOLD-OUT Luke Combs tickets and a $50 Tony Roma’s gift certificate with Bloomington-Normal’s #1 Country, B104!